Thanks again go to Rene Larsen (RLasen on Audizine) for yet another contribution and the content for this article. The Lap Timer is an option not enabled on the A4, I believe it was enabled on the S5 though although I don't know for sure. If you do not have the this option enabled on your car yet go to the vag com section to see how you enable it. Make sure you have the proper wiper stalk first though as you will require all of the buttons shown to use this option. It's interesting to note that this is the only place you can view your actual oil temperature as well. Take a close look at this image as it is the main basis for the entire operation of the Lap TImer. •	With the ignition switched on, keep pressing the "Reset" button B (Fig.1) until the lap timer appears. •	Press the top part of A (Fig. 1) again. The time for the next lap starts simultaneously. •	Each time you press the top part of A (Fig. 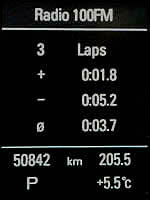 1) when the lap timer is running, the current lap time is stored and the next lap time is started simultaneously (Fig. 3). Simply repeat this procedure to record subsequent laps. •	Press the bottom part of A (Fig. 1) to display the split time (Fig. 4). 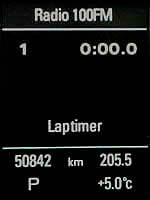 The recording of the lap time continues in the background while the split time (the top line – here #4) is displayed. •	Press the bottom part of A (Fig. 1) again if you want to pause the timer. The lap timer is interrupted and the asterisk in the bottom line disappears. •	Press the top part of A (Fig. 1) to resume lap time recording from the split time or pause mode. •	When you cross the start/finish line, press the top part of A (Fig. 1) to store the final lap time. The new lap time (which always starts simultaneously) will not be recorded if you now evaluate the lap times. •	Press the "Reset" button B (Fig. 1) for about two seconds. A summary of key lap times appears in the display. •	While the overall results are shown in the display, press and hold the "Reset" button B (Fig. 1) for at least two seconds to reset all data of the lap timer to zero.